which has natural hot springs and with a lot of Japanese character. Free Wi-Fi is available in all guest rooms and the hotel lobby. There are many onsen ryokan in the area of Kanzanji Onsen which is located on the east coast of Lake Hamana near the heart of Hamamatsu city. Hotel Kokonoe is a pure Japanese style ryokan which not only has the best location with the most spectacular views of Lake Hamana, but they also serve great quality food, and offer superb services and onsen for guests. The open lobby lounge and the magnificent views from all the guest rooms which changes from season to season entertain guests throughout the year. You can spend special moments away from your daily life by the attentive caring and superior services offered by this hotel. There are two Grand public baths "Hot spring of Enshu picture scroll" and "Hot spring of Taisho Roman style" that are separated by gender but alternating use by men and women between mornings and evenings each day. 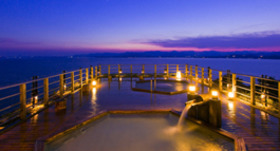 You can enjoy 20 different kinds of baths while watching the majestic sight of Lake Hamana. 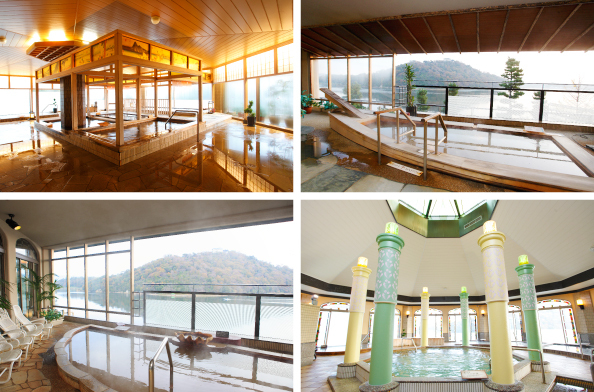 There are also private baths for reservation which consist of both open air natural hot spring bath and indoor bath. 10 kinds of baths including an indoor hot spring with a glass picture expressing the world of Hiroshige's ukiyoe; a cozy bath made from Hinoki Cypress from Tenryu and a boat shaped bathtub in open air bathroom. The Grand public bath which has the ambience of Taisho Roman style has classical modern stained glass arranged into windows and the ceiling. There are 10 kinds of nostalgic, elegant and unique selections of baths in this room. The natural crystal bath is the very first in Japan and a shell motif bath looks very romantic. You have the option to choose "Kaiseki ryori" (formally arranged cuisine). You will enjoy the seasonally arranged food options which use fresh ingredients that are locally grown in Enshu and represent items found naturally in the area from the sea, mountains, and lake. 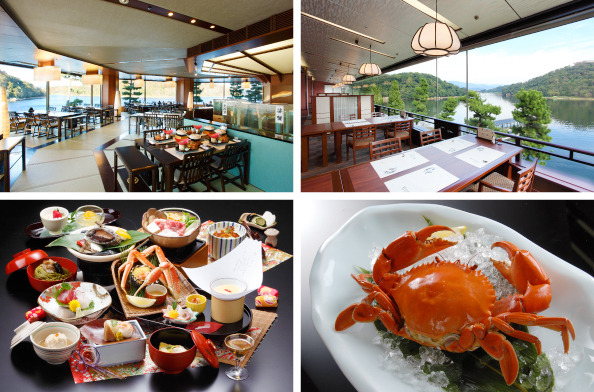 You can also choose the special menu which has "Douman crab" and "natural Fugu rubripe from the sea of Enshu". This menu is seasonal. There are various types of rooms available such as large, genuine Japanese style rooms; western style rooms; rooms with an open-air bath, and a special luxurious room on the top floor. 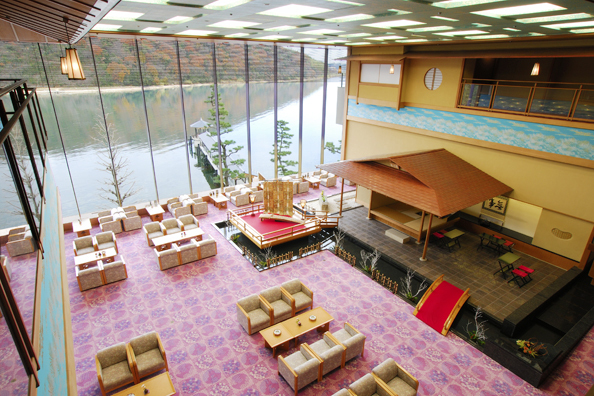 You can get a full view of the majestic Lake Okuhamana from every guest rooms. There are additional facilities and services that you can choose to help you enjoying your stay such as the rental of color yukatas (¥540) which is very popular among ladies and foreigners. You can also shop at the hotel shops where you can buy local specialties. Spa services and massages are available in locations with beautiful and relaxing views. 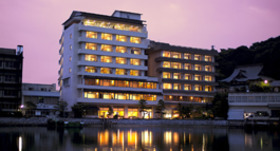 Not only does the hotel lobby have a tea-ceremony room, but there is also a stage where you can enjoy listening to the sounds of koto in the morning and a flute performance live after dinner on special evenings. During the summer, hotel guests can use the Pal pool for free. It is connected to the hotel through a path for guests only! Free-and-easy bus tour "ENSHU-DOCHU HIZAKURIGE"
Limited to guests staying at Kanzanji-onsen affiliated hotels and inns, the itinerary of this free-and-easy bus tour conducted by local guides is changed every 2 weeks or so. Wouldn't you like to go on a 3-hour mini-tour around the various tourist attractions while being introduced to beautiful natural scenery for each season? Limited to guests staying at Kanzanji Onsen. Please book your bus tour at your place of accommodation. Reservations are accepted until the day before the tour on a first-come-first-served basis. Prior reservation is recommended as the tour may be fully-booked sometimes. ※Guests who arrive in cars can park their cars for free in the car park of the Tourism Association. 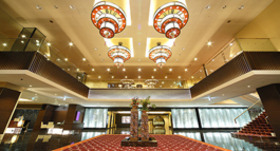 ※Guests who arrive using public transport will be picked up at the various facilities. Internet Free Wi-Fi is available in all guest rooms and the hotel lobby. [Free shuttle bus] ※2-day advanced reservation required. Take the "Kanzanji Onsen" line bus (46 minutes ride) at bus stop #1 of the bus terminal to "Kanzanji Onsen" then walk (3 minutes). 15 minutes from Tomei Hamamatsu Nishi I.C. Miscellaneous A cancellation fee will be applied within five days of your reservation.